In terms of works that stuck out this month, there wasn't a lot. There were a few disappointments (The Design of Future Things by Donald A. Norman and Present Shock: When Everything Happens Now by Douglas Rushkoff) but only three that stuck out to any degree. To be fair, I've read Bartleby before but it came through as a title to review this month and it had been a while so I figured another listen was worth it, since I do enjoy it. I'll save talking about the narration as that's part of the professional review I wrote. But Bartleby is on of my favorite Melville stories and I love to teach it. The tension and consternation of the narrator with Bartleby is wonderful to watch as he knows not how to deal with such a direct force as Bartleby and his "preferences." 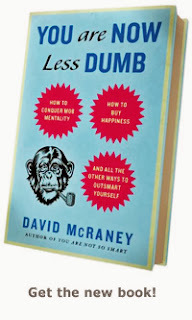 Books like McRaney's are great as I find them to help center me and keep a wide open perspective about how people come to see the world (including myself) and how even when we may think we are right or see something clearly, we are substantially bogged down by external and internal forces that lead us to believe we know more than we might. It earned a 5-Star rating (meaning I think it's required reading for everyone!) because I think so much of dialogue on so many different subjects could be enhanced through learning about the different ways in which despite our best efforts, we often fail at communication.